S. Rosaleen Simpleman stands beside the Flag of Honor she gifted to the Delhi Township Administration Building. As we prepare to celebrate Memorial Day on May 28, we remember and honor all of the women and men who have died for the United States of America. This year, a very special Flag of Honor was given to the Sisters of Charity Archives by S. Rosaleen Simpleman in the hopes that it could be displayed in a place where it could be cherished by many in remembrance of those who tragically died on Sept. 11, 2001. The Flag of Honor was created to immortalize the victims of that fateful day. It lists the names of every 9/11 victim in each stripe of the American flag so that their names are forever a symbol for America and so that we will never forget them. S. Rosaleen was gifted the Flag of Honor by her brother-in-law, Joseph Dwyer, a veteran of the United States Air Force. She could not find a proper place for it, and so it was kept in a drawer for several years. Recently, Sister came across the flag and knew that it should be honored in some way. She decided to bring the flag to S. Joyce Brehm in the Sisters of Charity Archives. S. Joyce contacted Lenny Kleiner, a former transportation worker for the Sisters of Charity, and also a board member of the Delhi Township Veterans Association. Lenny had previously worked with S. Joyce to add the names of the Sisters of Charity who were Civil War nurses to the Delhi Veterans Memorial, and he was helpful in this situation as well. 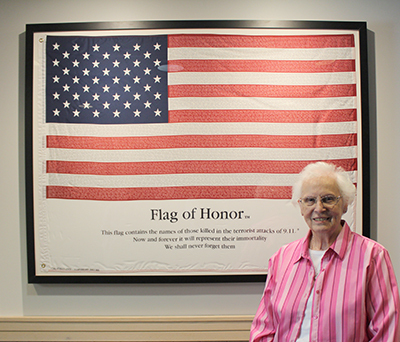 S. Rosaleen’s Flag of Honor has since been framed and is mounted on the lobby wall of the Delhi Township Administration Building on Neeb Road. S. Rosaleen and her brother-in-law are absolutely delighted that the flag will now be properly honored for years to come.